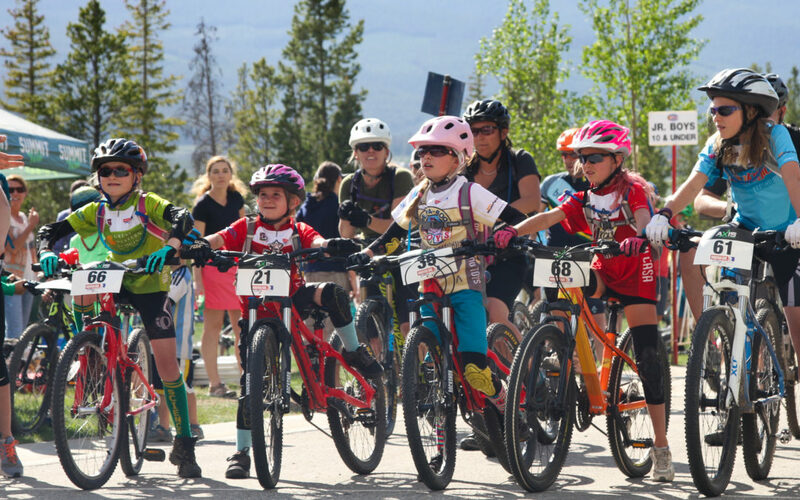 The Evolutionary Power of 10-year-old Girls…and Donuts-By Anne St. Clair and Jeff Westcott | Maverick Sports Promotions - Where the athlete is first! What did Maddie Haser just say? Did she really just say “Donut Hill”? I was transfixed as she told Mountain Bike Junior League Coach Andrea Wilson about a Group Ride that took place an entire year earlier. I stopped and listened to Maddie tell Andrea that “last year Anne promised us donuts if we made it up Donut Hill”. It was the first Mountain Bike Junior League Group Ride of 2018 at the Frisco Adventure Park. The first race in the Summit Mt. Challenge Series was 48 hours away. 70 kids showed up to pre-ride the course and blow off some steam! School was about over, the energy was high and the kids were super excited. Maddie, the current U12 Girls IFSA (International Freeskiers & Snowboarders Association) National Champion, was so animated as she talked that I was stopped dead in my tracks. You see, there is a hill on the Frisco Roundup race course that is a nemesis for many people. I have referred to it as “Buzzsaw Hill” because it’s on the Buzzsaw Trail. I’ve also called it “that pain at the end of Buzzsaw” and a few other choice names. But it has never had an official name; until now. Over the years the preferred line on this hill has moved from right to left, it’s gotten rockier, looser and it’s still 100% rideable. In other words, this hill has changed; right along with so many other things in our area. It has evolved and it still “works”. And our kids have evolved too! In 2017 MTB Junior League Coach Anne St. Clair motivated her group of girls with the promise of donuts if even just one of them cleaned this hill. “I wanted to foster support with the idea that one girl’s success was reward for all of them”, Anne said. I mean, what kid doesn’t like a donut? And that move created a “we’re in this together” mentality. Everyone took their shot, others cheered them on…and no one made it. Not one. At Mountain Bike Junior League Group Rides we talk about all kinds of stuff. What if someone crashes here? Where am I anyway? Could I tell anyone exactly where I am if I got hurt? We play “Trail Tag” and let the more mature kids lead the group to designated stopping stops. On Group Rides we talk about etiquette, how to interact with other trail users, and what to do if “this happens or that happens”. It’s awesome watching the gears turn and seeing kids problem solve. “One of the girls crashed on Gold Run Road. When I got there the girls had stopped, they had moved their bikes off the trail, a first aid kit with band-aids was out and a kid was hiking up the trail to find a parent. Knowing how meaningful donuts are to ten-year-old girls and how meaningful those decisions and actions were, I got them donuts. Merrick, Aisley and the other girls that were ahead even stopped and waited at the pavement not knowing what was going on but knowing to wait even though the ride was essentially over”. Yes! Good behavior! Love this stuff! Evolution was happening before our very eyes! What started as a way to get kids athletically motivated (donuts), turned into a reward for doing the right thing. Back to this year and Maddie Haser. There she was in the middle of a huge group of girls chatting away about “Donut Hill”. The next day while course marking I ran into someone who asked if “Donut Hill” was going to be part of the course. There’s that name again, I said to myself. Two nights later, at the actual Frisco Roundup race, I overheard the normal great stories of what happened out on course. I walked by Craig Campbell who said his first-time-racer daughter Victoria “almost cleaned Donut Hill”. There it is again! Wow! Being a bit of a history nerd, I love learning how things get named. We have trails in Summit County called Heinous Hill, Vomit Hill, Slalom Singletrack, and Yellow Brick Road. Well, in the span of 2 days in the summer of 2018 a never-before-named feature that has been in every single season of the 32-year-old Summit Mt. Challenge Series had a name. And the roots of that name went back a full year earlier. I don’t know if any of the girls that were bribed with donuts have cleaned that hill yet. And I don’t care. But I know all of them still ride mountain bikes, seem like good people, and hopefully eat a donut now and then! As for who gets naming credit? We all do! For embracing an outdoor culture that challenges, educates and inspires!